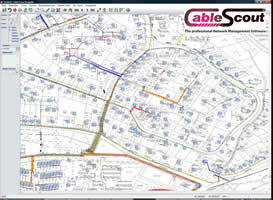 CableScout ® is a documentation and information platform that has been developed specifically for the management of telecommunications networks. 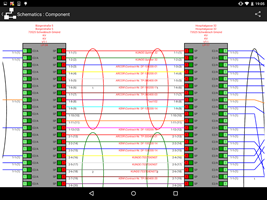 It enables all types of fibre optic and copper networks to be documented and efficiently managed both on a physical, logical and virtual level, in other words, from the georeferenced position to the signal layer. cableScout® supports all relevant technologies in the transmission and access sectors including SDH, PDH, xWDM, xPON, Ethernet/IP, xDSL and FTTx. It enables complete networks, together with all their associated buildings, trenches, ducts, manholes, cables, connections, active and passive components, signals and services, terminal devices, connectors and sockets to be displayed. Attributes and documents can be assigned arbitrarily to each of these objects. For example, contracts, OTDR reports and invoicing information can be stored for every single fibre in the network. 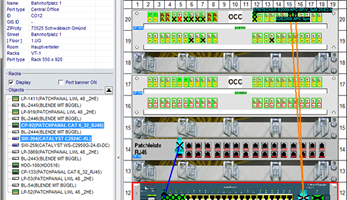 schematic plan are interconnected and update each other in background mode. This seamless interaction between geographic, functional and logical information ensures a comprehensive overview of the overall actual situation of the network at all times.